Reminder: Tuesday Funk #122 is tonight! We've got a heckuva lineup: Lily Be, Alec Nevala-Lee, Tom Haley, Chelsea Fiddyment, and Britt Julious. And of course, co-hosts Andrew Huff and Eden Robins, who will be biting their nails to the quick just like the rest of you. 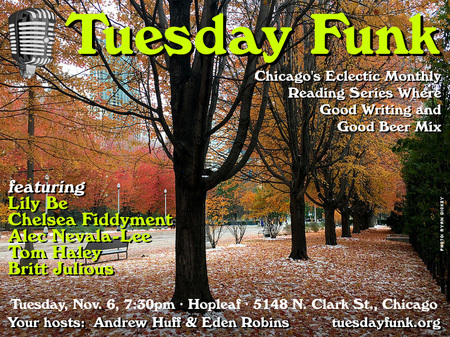 Our readings take place at Hopleaf Bar, 5148 N. Clark St. in Chicago. We get started promptly at 7:30 pm in the upstairs lounge. Arrive early if you want a seat -- but no earlier than 7:00 pm. Our readings are free, but only those 21 and over will be admitted. No food can be brought in from the restaurant. See you there! This page contains a single entry by Eden Robins published on November 6, 2018 7:36 AM. Meet Our Readers: Britt Julious was the previous entry in this blog. November 2018 Debrief is the next entry in this blog.